Are you eagerly awaiting the snowy season in order to take a peek at what critters have been scurrying through your backyard? Studying prints left by animals is an ancient activity that was first practiced by those who depended on hunting and gathering for survival. What’s scampering through in your area? Animals in the family Sciuridae, such as chipmunks and squirrels, have four front toes and five hind. Look for tracks that resemble a hopping movement in which the larger hind feet actually land in front of the smaller front feet. Another hopping critter you may find belongs to the family Lepoidae or rabbits and hares. These tracks will look similar to that of a squirrel however, the hind feet of a rabbit tend to land at an angle rather than evenly. Animals in the family Canidae, such as foxes, wolves, coyotes or your neighborhood dog, have four toes on both the front and hind feet. You may also notice visible claw marks. This will help distinguish members of the Canidae (dog) family from that of the Felidae (cat) family who also have four front and hind toes, but retract their claws as they walk. Tracks left by the family Mustelidae (weasel, badger, mink, skunk, and otter) can be identified by five toes both on the front and hind foot. Their most likely will also be visible claw marks. 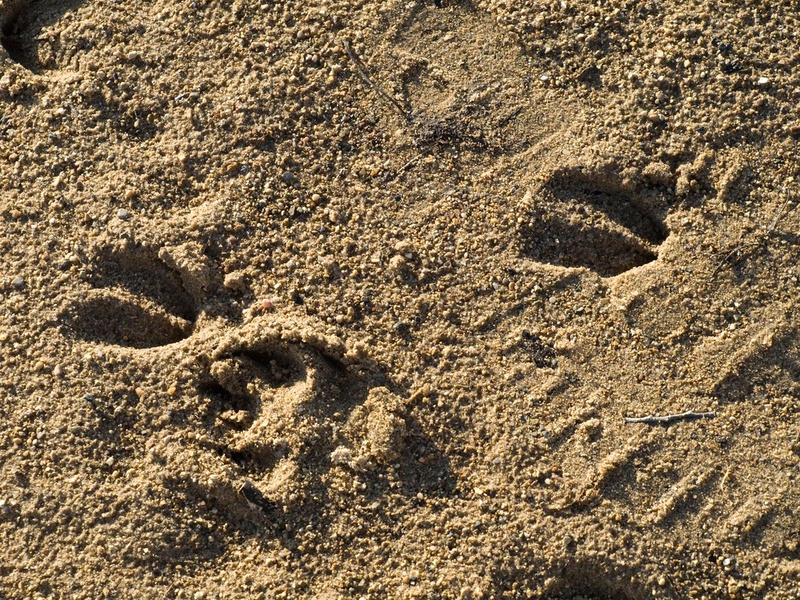 Animals such as a bear, beaver or opossum will also leave a track with five toes on the front and back. Most likely you will be able to tell the difference between a beaver and a bear as a bear print will be MUCH larger! Animals in the Cervidae family include deer, elk and moose. Their tracks can be identified by two distinct toes. The most abundant backyard animal in the family Procyonidae is the raccoon. Their tracks are distinguishable by hand like print with five toes on both the front and hind feet. Measure the length and width of several prints. On many mammals the front feet will be larger since they support more of the animals’ weight. Measure the stride (length between prints) and the straddle (width between prints), this can give you an idea of how quickly the animal was moving. Look for a heel, count the number of toes and look for any claw marks. Follow the tracks and note any patterns. Where do they like to hang out in your backyard? Do not disturb! If the tracks lead to den or resting place, respect your backyard friend and do not disturb! 10+ Naturalist Resources for Identifying Wildlife: A number of sites that can help identify a feather, track down an animal print or teach more about a flower. Make your own Animal Track Twister board: Use the patterns provided to make your own animal track Twister mat and play a fun game of “Tangled Tracks.” Follow the tracks and you may end up in a tangled knot! Tricky Tracks lesson plan: Designed for K-4 students, this lesson teaches kids to identify tracks of several types of mammals. Attract native wildlife all year long by becoming a wildlife gardener!